This statistic shows the latest purchase prices of NBA franchises as at September 2017. In 2017, the Houston Rockets were purchased for 2.2 billion U.S. dollars. Typical sales prices range around 200-400 million U.S. dollars. The smallest price was paid in 1983, when Herbert Simon purchased the Indiana Pacers for 11 million U.S. dollars. In 2014, an NBA record-breaking sales price of 2 billion U.S. dollars for the Los Angeles Clippers was negotiated. According to cnn.com, Donald and Shelly Sterling, co-owners of the team, agreed to sell to former Microsoft CEO Steve Ballmer. As at June 17, 2014 the sale of the Los Angeles Clippers has not officially been completed and is still subject of legal proceedings. In 1981, Donald Sterling had purchased the team for 12 million U.S. dollars. 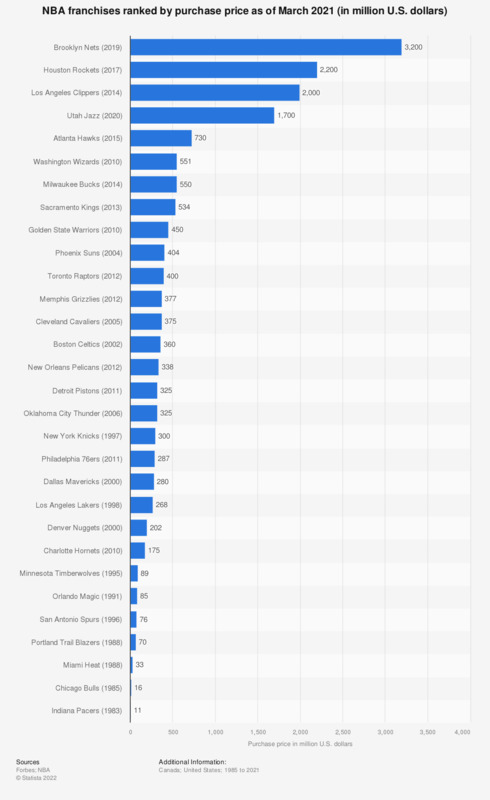 In comparison to the reported possible sales price of two billion U.S. dollars, the Los Angeles Clippers franchise was ascribed a franchise value of 575 million U.S. dollars by Forbes in January 2014. This valuation puts the Clippers right amongst the middle pack of the league in terms of franchise value. The most valuable teams according to Forbes are the New York Knicks, the Los Angeles Lakers and the Chicago Bulls. All three teams have a franchise value of one billion U.S. dollars or more.